The weather station in the Jacob Jensen design is a series of unique functional products that will help you to stay in a permanent contact with the weather and the time. This Jacob Jensen series consists of several elements. The main products of the series are easy to read and to handle. The result of the Jacob Jensen thinking principle: elegance and unobtrusiveness in a perfect balance between form and function. 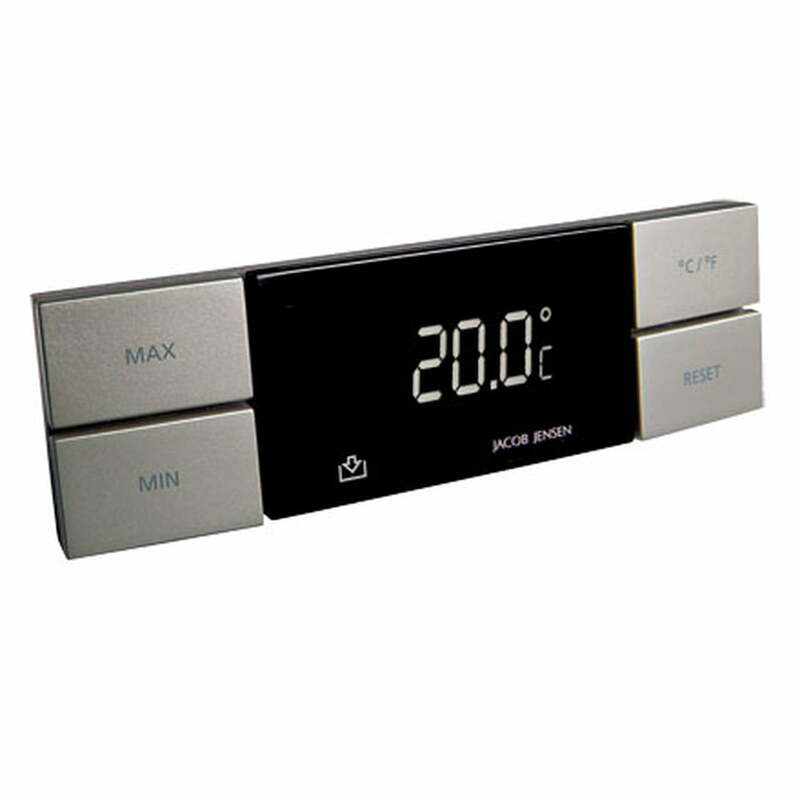 Only four large buttons direct and control all functions and the display. The classic Jacob Jensen design makes the glimpse to the weather a real enjoyment. Measurement of the room temperature. Saves minimal and maximal values. Optional Celsius or Fahrenheit. Display shows the air-pressure in two different optional pressure units. Weather tendency shown with symbols. Easy adjustment of the height over the sea level at a new installation. 24 hours display with alarm function, light and snooze function. Wireless temperature station that displays the measurements of additional sensors. Delivered completely with exterior sensor. Further temperature sensors are available as single parts. Up to maximal three sensors can be used at a time. Each sensor saves the lowest and the highest measured value. Optionally displaying Celsius or Fahrenheit. All elements of the Jacob Jensen weather station run with micro batteries (AAA). Please note that with your order, to assemble the weather station you will always need the ground panel! For every further element you will need an attachment panel for each one.